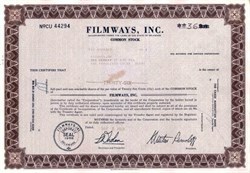 Beautifully engraved uncancelled certificate from the Filmways, Inc. issued in 1969. This historic document was printed by the Security - Columbian Banknote Company and has an ornate border around it. This item has the printed signatures of the Company’s Presidentand founder, Martin Ransohoff and is over 33 years old. There is a small mark in the center of the certificate but otherwise in EF+ Condition. Filmways Pictures began in 1960 and lasted until 1983. Independent motion picture and television company. Later became part of Orion Pictures in the early 1980s. Once owned independent production company Heatter-Quigley Inc. (in the mid '70s), program distributor Rhodes Productions (1975-early 1980s), and animation studio Ruby-Spears Productions (1978-1981); also merged with American International Pictures in 1979. AIP's TV division became the new distribution arm of Filmways Television, which also replaced Rhodes shortly after.